Airbus employee and writer Gareth Evans has been involved with human powered aircraft projects for many years. Here, he lifts the lid on what goes into their design and construction, and how several UK universities are embracing the hobby to promote engineering skills. Lie in the long grass on a summers’ day, look up at the sky and watch the contrails form. The aeroplane is ubiquitous; a physical network of people and things, mirroring high above us, the virtual objects travelling through fibre optic cables below our feet. Modern aeroplanes are amongst the most complex machines made by man, and it is a tribute to their reliability that we are mostly oblivious to this fact. 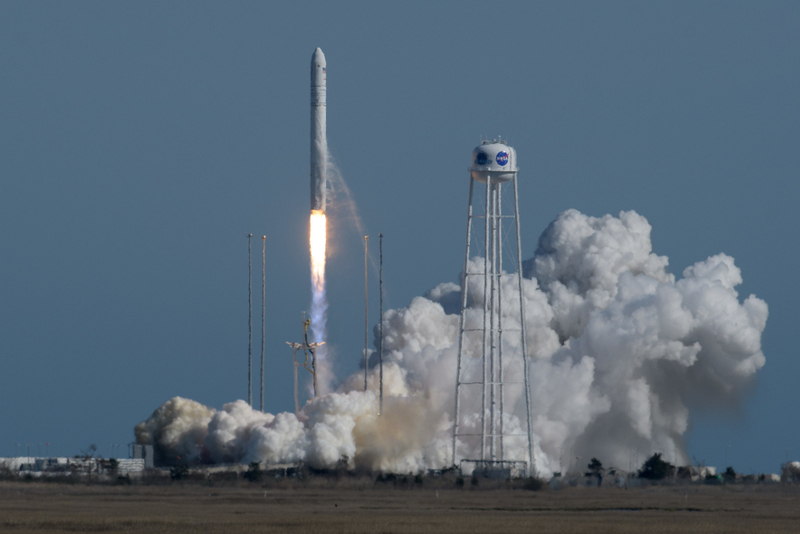 It seems strange then, that the aerospace industry has no nursery school for their design and construction among the young, but the historic reasons for this are clear. Manned flight carries obvious risks that no other form of transport entails, and a century of air travel has built up an intense regulatory framework which guarantees a status quo of safe, familiar technology, but stifles the playful engineering freedom granted to undergraduate students building ground-going vehicles as part of their university course. This situation has started to change in recent years with the rediscovery of human powered aircraft as a viable degree project. Traditionally built to win arcane prizes, or to demonstrate the zenith of lightweight aerodynamic design, the human powered aeroplane has been reborn as an educational tool to compliment the plethora of student racing cars, electric wheeled vehicles and water bound craft. Being unregulated and inherently benign to fly, they are a perfect platform for new aeroplane designers to practice the art. To the unfamiliar eye, a human powered aircraft, cruising just a metre or so off the ground, its large propeller flicking round in silence like some giant insect wing in response to the thrashing of bicycle pedals at its pilots feet, can appear ethereal or even absurd. Take an objective view however, and we discover that a human powered aircraft, or HPA for short, is in fact, just a very low powered, aeroplane embodying most of the same key elements that define a fighter jet or modern passenger plane. For it to work at all, the builders must solve every practical problem of aircraft design; not just present a thesis on elaborate low speed aerodynamics. Building a successful HPA within a university environment is an exercise in total pragmatism. Expert application of aerofoil selection or wing planform optimisation can easily be let down by a poor choice of undercarriage wheel, or lack of consideration for the cockpit seat for example, which must double as a position from which an extremely delicate machine is controlled in pitch, roll and yaw, and also be a solid mount from which the human engine can produce the 300 or so Watts normally required to fly. 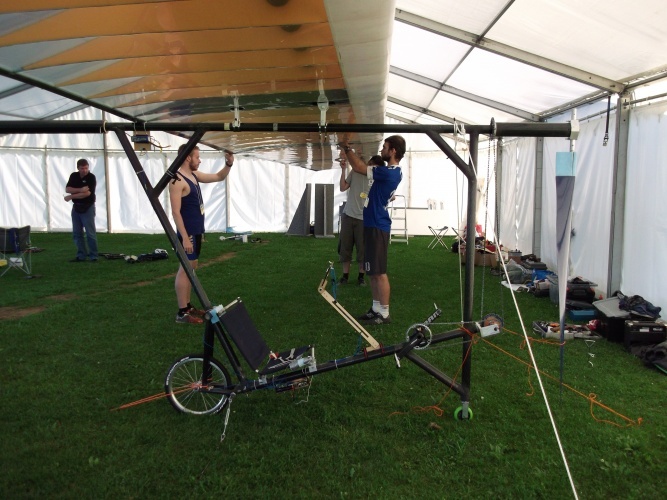 Nikul Bhadasia and his team at the University of Western England in Bristol began a study of human powered aircraft in 2016 by investigating the manufacture of an airframe type commonly associated with HPAs and other similar low powered aircraft. From the cabin window of a passenger jet, most of what the occupant sees is load bearing structure. Typically the visible wing surface can be considered a box beam. The inside is almost completely filled with jet fuel. An HPA, flying with less power than most domestic hair dryers, let alone a gas turbine, must weigh approximately half the mass of its occupant, and yet have wings big enough to lift him or her at speeds around human running pace. 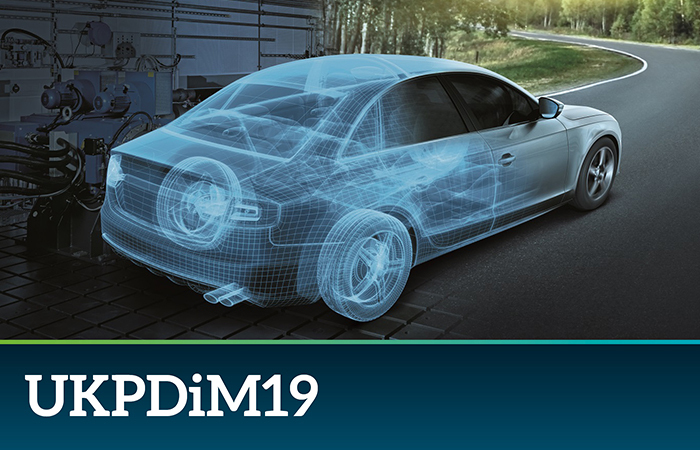 Calculate the total mass of aluminium alloy or carbon fibre to meet your weight target and it becomes clear this quantity can never be distributed across the whole wing in the manner of a passenger jet. Wing skins would be impossibly thin and buckle immediately. A skeleton of thin walled load bearing tubes is the popular solution, frequently made from hi-tech carbon fibre. The aerodynamic shape of the aircraft is merely combinations of low–tech Styrofoam formers, slid onto this skeleton and covered with polyester shrink wrap film. Tubes, although theoretically inefficient if one only has to deal with a single plane of bending, have favourable trade-offs when it comes to rigging and disassembling the necessarily large wings of an HPA for road transportation. Excellent load transfer, at negligible weight penalty, is achieved by merely telescoping cylinders of slightly different diameters together, overlapping about four diameters. Tubes are easy to manufacture using composites too, and the spiral winding of narrow uni-directional tapes onto the required diameter is a typical method, but can cause problems with mandrel extraction from the finished article (post oven curing) due to resin shrinkage. Stories of rugby teams being used to extract tooling from HPA wing spars are legend. 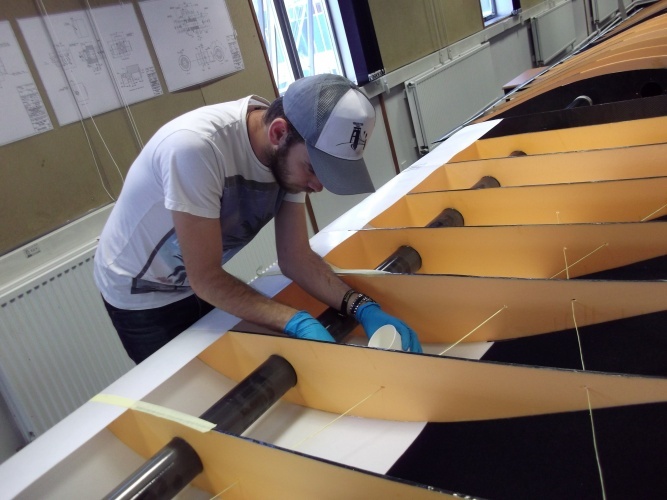 At the University of Western England, students instead experimented with a different method of creating composite tubes which has none of these extraction issues. 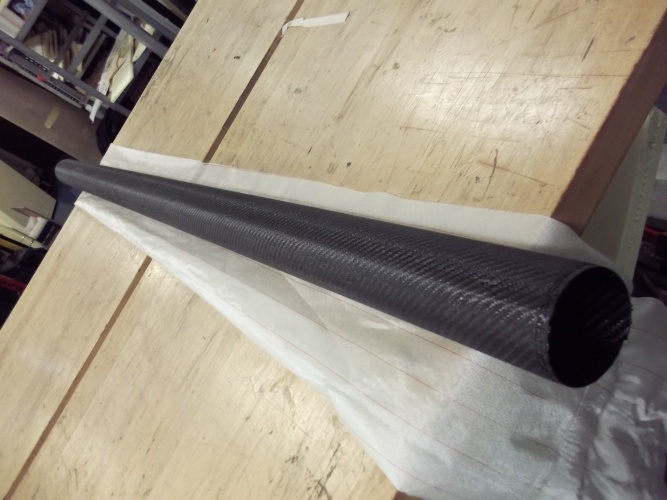 Resin impregnated carbon fibre is available in woven cloth form as well as uni-directional material. 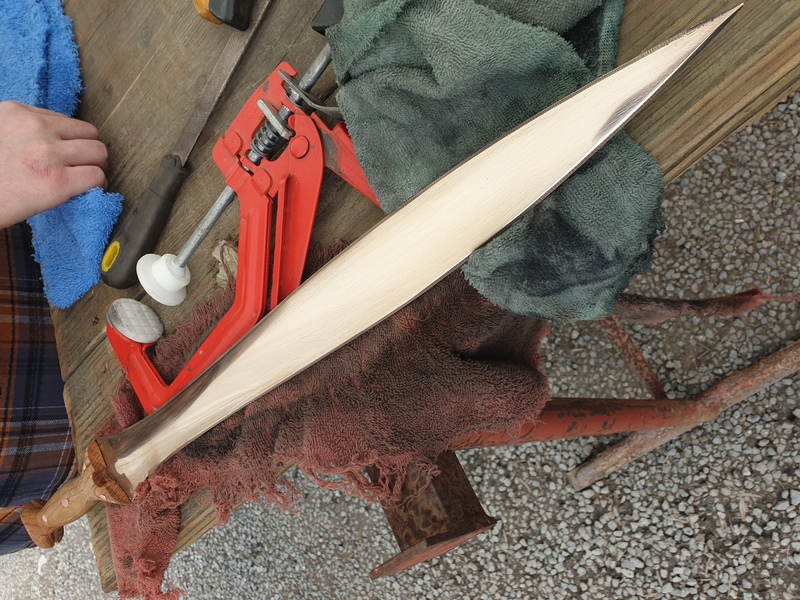 This means that a single strip, as long as the tool can be cut and roll wrapped onto the mandrel. The method incorporates fibres in the plane of the load and fibres to counter buckling simultaneously. Progressive layers can be applied and tacked together with an overlapping seam of a few millimetres running parallel to the tool. The zero/ninety arrangement of fibres in the cloth allows layers to be cut with warp or weft at any angle to the tube axis required. Using a hand lay-up process, students found it tricky to eliminate wrinkles (the uncured cloth has the stickiness of liquorice). Supporting the mandrel at its free ends and using cheap plastic wall paper rollers to progressively fold down each new layer onto the previous one proved the solution. A back and forth motion with the roller by one student accompanied by a slow rotation of the mandrel by another ensured full consolidation. Finally the job is wrapped in a heat shrink tape and oven cured at over 100°C. As the resin begins to flow, each layer can slide independently, curing at the maximum diameter of the tool at full oven temperature. On cooling, the mandrel (aluminium is preferred for its expansion coefficient) falls easily out of the job providing the students have remembered to coat it thoroughly in release agent. A number of useful lengths of airframe tube were made at University of Western England and subjected successfully to loads that might be experienced in a finished aircraft. Leading the UK revival of student HPA design is Bath University who completed and tested their first machine in 2011, making a few brief hops into the air. 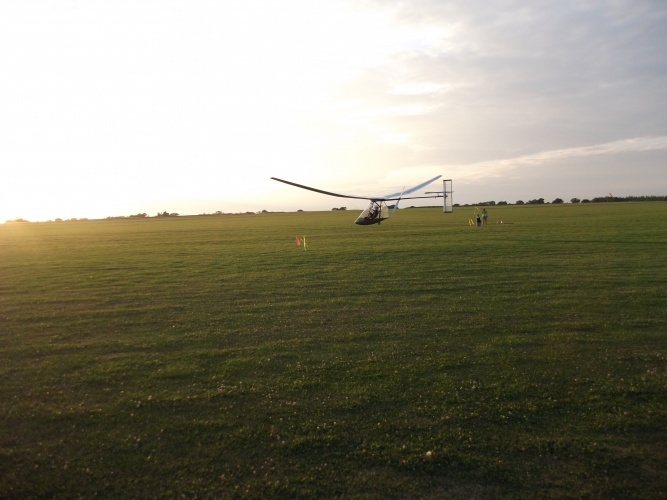 Two more student designed aircraft followed and their latest, BUMPAC (Bath University Man Powered Aircraft) led by Lewis Rawlinson, took to the skies this summer at the British Human Powered Flying Clubs July rally, setting records for undergraduate flights in the process. This aircraft is the culmination of seven years’ experience in which more than twenty students have achieved MEng qualifications working on a full sized aircraft that any number of them can potentially pilot and power. This time, lightweight tubes, ordered from a specialist manufacturer catering for the sailing industry were cut to length and mitred together to make the pilot space frame of the Bath machine. An MDF jig sculpted on the university laser cutter holds the pieces together while structural adhesive cures. Each joint is then reinforced with strategically placed carbon fibre tapes, stippled through with laminating resin. Peel ply, a kind of non-stick cloth, is tied tightly over the joint to consolidate the materials. The result is something with the strength of a welded farm gate weighing just a few kilos. Add a seat bent from the thinnest aluminium tubing, a wheel from a small folding bike, pedals, cranks and three lengths of lightest bicycle chain to the drive shaft and our HPA takes shape. With only one effective throttle setting, propeller blades can be tailored to generate maximum thrust with minimum blade drag at precisely the power output of a human cyclist. Wings, the largest component of the plane, are mostly fresh air. The laser cutter, easily programmed to produce the special laminar flow aerofoils for flight at low Reynolds numbers, makes light work of the 80 ribs required. The raw material is not unfamiliar; it is the same foam used in fish and chip trays. Usually thrown in the bin, here it becomes an aerospace material. This apparently flimsy foam is reinforced along the top and bottom of each rib with raw carbon fibres, not unlike horse hair. This roving, as it is called, is attached with liquid epoxy resin applied carefully using small paint brushes. Roving of a different kind, Kevlar, commonly used in bullet proof vests, weaves a diagonal truss to protect our long wing from drag loads. The leading edge radius for the aerofoil is defined by more foam sheeting, folded back along the chord as far as the theoretical breakdown of laminar flow. 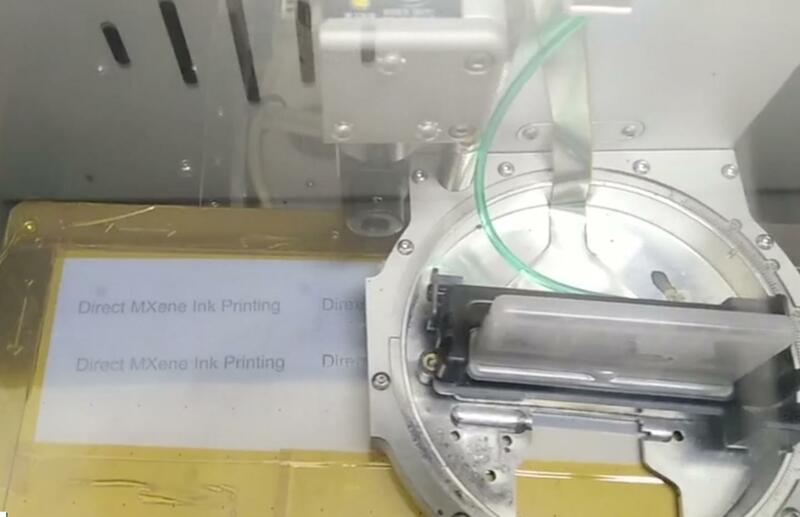 Various combinations of double sided tape and rubber contact adhesives are applied to hold the sandwich wrap style covering to the frame. A quick wave over with a hair dryer and the covering is drum tight…..at least for the duration of the contest. This apparently simple flying bicycle is a subtle combination of the instantly disposable, and the cutting edge in more than just a material sense. Control loads for the all moving tail and rudder fall within the capability of off-the-shelf servos, normally at home in radio controlled model aeroplanes. A fully fly by wire system, actuated by an adapted Play Station joystick on the pilot seat, provides an opportunity for processing the command inputs and logging data while the aircraft is airborne. On most flights, a laptop computer is used to make some adjustment to the on board flight computer of the Bath HPA before take-off. Modern electronics means the whole system can be lighter, including the printed circuit boards, than the Bowden cable and pulley operated systems chosen by other more mature machines at the HPA flying rally. At the end of each flying session, the Bath students have data to download from their machine, and graphs to plot, further adding to the sum of experience with a type of flying machine working at the margins of controllability. The Bath University aircraft is based on proven HPA technology, but the absence of regulation and benign flight envelope provide opportunities to experiment. Ramon Fuertes’ team at Sheffield University have, for example, taken a different approach altogether. A compact three wheeled space frame lacks the normal long tail boom and horizontal surface. Only a rudder for directional control is used. Both pitch stability and pitch control are effected directly through the wing. Certain aerofoils with a reflex camber line produce little or no torque about the point where the spar is positioned. One of the most historically famous HPAs, the Gossamer Condor, used such a section, but the often misunderstood canard surface supported very little load. 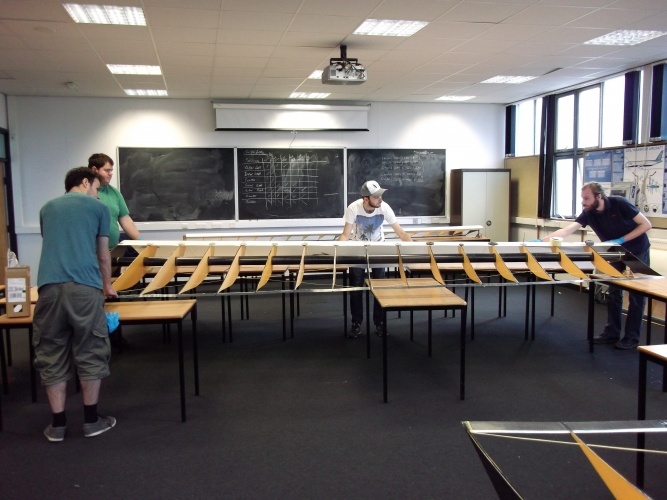 With no second horizontal surface at all, the Sheffield students have a tilting wing concept of the kind used by the flying flea (a light aeroplane of the 1930s). Today, the movement of the centre of gravity relative to the wing is familiar to flex-wing microlight and hang glider pilots. The Sheffield machine is compact and requires a particularly small and light pilot, it just fails to repeat the feat of previous years in getting airborne during the 2016 event, although previous attempts with ground runners tethering the machine show the principles are correct. There are currently more HPA projects in progress at Wolverhampton University, Southampton University, with interest at Loughborough and Queen Mary London. 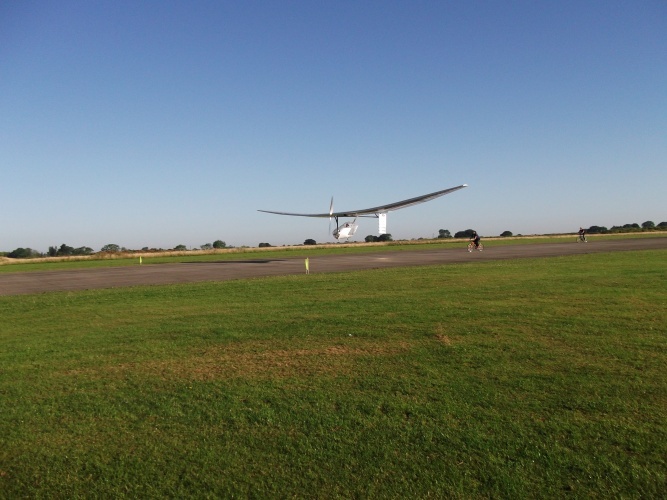 Human Powered flying is coordinated by the British Human Powered Flying Club, an affiliate of the British Hang Gliding & Paragliding association who provide full insurance cover for the activity. Most of the information, (and ready-made propellers) are available from the above source. 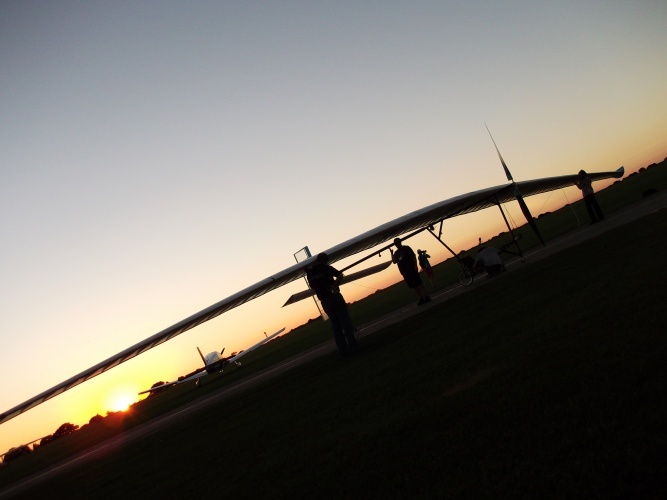 Fifty years from the first flights, Human Powered Aircraft have found a practical use. Consider the advantages of a generation of new graduates who will already have designed, built and flown an aeroplane before they begin professional aerospace careers. Huge shout-out to Bruce Edwards, Danielle Winton, Pierre Thomas, Lauren Shipway, Cat Jones and Magda Nyadu for their work designing and completing 80% of the University of Bath HPA which finally flew in 2016. And to Stuart Chell who performed at least 50% of the aforementioned 80%. Also forever grateful to the 2016 team for finishing what we started. Wish I could have been there! Good article by Gareth. Let’s hope that many more universities will join in and use HPA projects as an educational tool. “….using cheap plastic wall paper rollers to progressively fold down each new layer onto the previous one proved the solution.” A well known and very early experimenter of Carbon fibre(s) used for high-teck applications (compressor blades) located not a million miles from a Northern City with a horse-race named after it- needed rubber-covered rollers to ‘squeeze’ resin onto and then from what used to be called pre-pregs before entry to a curing oven. They spoke to all the high-tech roller manufacturers: none of which could assist. Driving home one evening, one of the Engineers was stopped at a traffic light: and from his car he could see a junk-shop. Inside this were a series of mangles (used before spin dryers to extract moisture from washed clothes): pairs of rubber-covered rollers. exactly the correct width and hardness! On a whim, he bought one, and when such was shown to be exactly what was needed, apprentices were dispatched to all the other such shops in that city (and elsewhere) to buy up as many as they could. The total investment was about £200! I need not describe the subsequent history! CF was born! I was not that Engineer, but a dear friend was!